This is the archived site of the 38th Annual ORSNZ conference. Current conference information can be found at http://www.orsnz.org.nz/conf. Conference Twenty Naught One of the Operational Research Society of New Zealand. Many thanks to PA Consulting Group, Charles River Associates, and Jade Corporation for their generous support of this Conference. See abstracts and papers already submitted. On site, you can register at our preconference Social, 29 November, 7 to 9 p.m., or just before the opening address on 1 December, 8 to 9 am. More details on conference fees (including information on the Banquet and additional copies of the Proceedings) are listed in the Registration form. We cannot accept American Express. See Programme Twenty Naught One! The venue will be the University of Canterbury's Engineering Building, directly across from Commerce. Young Practitioner's Prize. The Young Practitioners competition is open to authors under 25 years of age on 1 Jan 2001. Papers must be singly authored. See the Registration form for more details. The Prize is NZ$1,000, to be given to author(s) of the best papers, according to the judges' discretion. Hans Daellenbach Prize. Nominations are closed for this prestigious prize. The winner will be announced at the Conference Twenty Naught One. Try again in a couple years! Join our pre-conference Social, 29 November, 7 p.m., at the University Staff Club, 87 Ilam Road. Banquet Twenty Naught One will be held 30 November, 6 p.m., Riccarton House, 16 Kahu Road, Christchurch. Sir Gil Simpson will be speaking. Canterbury Reunion Twenty Naught One - Celebrating 30 Years of Operational Research in Canterbury. The Department of Management will host a reunion celebration of Canterbury alumni. Tentative plans are for dinner, 6 p.m., 1 December. Maps of the University of Canterbury. The airport is north-west of the university. A taxi from the airport to the university costs about NZ$17. Bus routes on-line. From the airport, you can also catch a bus heading into the "city." Get off at the corner of Memorial Ave and Ilam Road, or Memorial and Clyde; it is then a 7 or 8 minute walk to the university. Memorial Ave is the main road from the airport into town, and is somewhat parallel to Maidstone and Creyke Roads. Conference participants should book their own lodging. If telephoning from outside New Zealand, replace "03" by "00643". The 64 is the NZ country code, 3 is the Christchurch area code. Academy Motor Lodge/Motel, 62 Creyke Rd, ph 03-351-9347 (free within NZ 0800-184-718), fax 03-351-6027, email [email protected]. Riccarton Mall Motel, 140 Riccarton Rd (opp Riccarton Mall), ph 03-348-8760, fax 03-348-7125. Chateau on the Park, 189 Deans Ave, ph 03-348-8999 (free within NZ 0800-808999), fax 03-348-8990. Luxurious accommodation in a pleasant location. Half-way between campus and the city, a 20 min walk via Deans Bush, or via bus, 15 min walk via Hagley Park. Ascot Vale Motor Lodge, 296 Riccarton Rd, ph 03-348-0207. Appolo Motel, 288 Riccarton Rd, ph 03-348-8786, fax 03-348-8786. Christchurch Motel, 252 Riccarton Rd, ph 03-348-9493 (free within NZ 0800-252-258). Clyde on Riccarton Motel, 280 Riccarton Rd, ph 03-341-1280 (free within NZ 0800-280-282). Ilam Motel, 250 Riccarton Rd, ph 03-348-5983. YMCA, 12 Hereford Street, ph 03-365-0502 (free within NZ 0508 962224), fax 03-365-1386. Near the Arts Centre. Email [email protected]. Airport and downtown. For the hotels below, we negotiated special rates for the Twenty Naught One. Millennium Hotel Christchurch, Cathedral Square. Copthorne Hotel Christchurch Central, 776 Colombo Street, Victoria Square. Copthorne Hotel Christchurch Durham Street, corner of Kilmore and Durham Streets. Quality Hotel Commodore, Christchurch Airport, 449 Memorial Avenue. Quality Hotel Autolodge, 72 Papanui Road. Links: Welcome to Christchurch and Canterbury, The Canterbury Pages, Lonely Planet. ASOR 2001 - Australian Society for Operations Research 16th National Conference, "Operations Research in the Third Millennium," McLarens on the Lake Resort, South Australia, 23-26 Sep 2001. 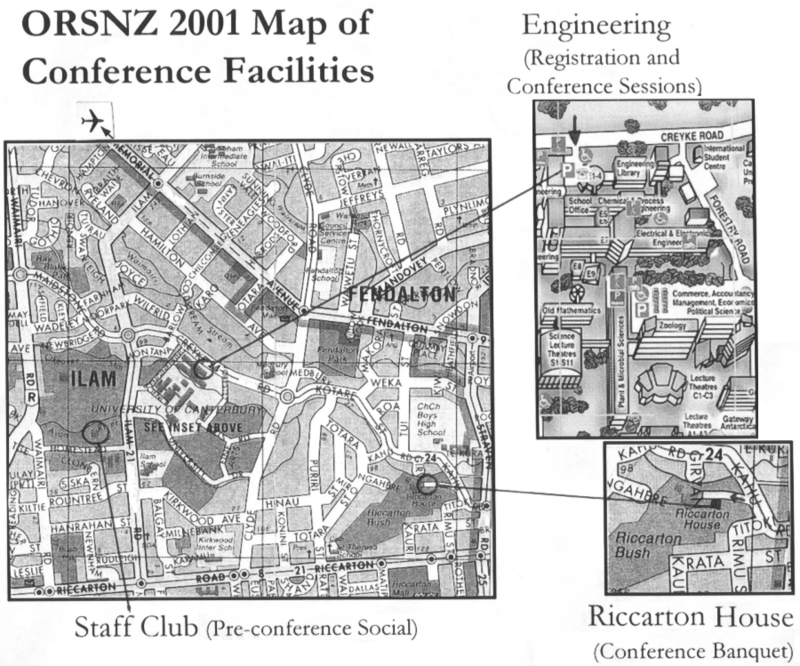 Australasion Biometrics & NZSA Joint Conference 2001, Park Royal Hotel, Christchurch, 10-13 Dec 2001.